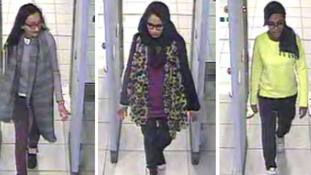 One of the three east London schoolgirls who travelled to Syria together to join so-called Islamic State has fled the group's "caliphate" and wants to come home. Shamima Begum, who is now 19, told The Times she is nine months pregnant and has had two infant children who are already dead. She spoke to the newspaper of seeing severed heads and how her fighter husband is in captivity, saying: "The caliphate is over." But security minister Ben Wallace has ruled out launching a rescue mission to Syria. Shamima Begum: What happens now IS girl wants to return to UK? On Wednesday, Ms Begum's elder sister, Renu, told ITV News she hoped her sibling would be allowed back to the UK. Ms Begum left Britain, using her sister's passport, with her two closest friends during the half-term break in February 2015. A year later, ITV News revealed that one of the other girls, Kadiza Sultana, had been killed in an airstrike on the terror group’s stronghold of Raqqa. Now stuck in a refugee camp, Ms Begum wants to return to the UK so that her baby can be cared for. "I'm not the same silly little 15-year-old schoolgirl who ran away from Bethnal Green four years ago." She said: "I could not endure the suffering and hardship that staying on the battlefield involved. "But I was also frightened that the child I am about to give birth to would die like my other children if I stayed on. "So I fled the caliphate. Now all I want to do is come home to Britain." On Wednesday, Ms Begum’s elder sister Renu told ITV News: "I’m so relieved that my sister has been found, safe and sound. "We are aware that she has been trying to get out. We lost contact with her for the longest of time. "We are happy to know that she is okay." Ms Begum had fled the eastern Syrian town of Baghuz during the fight of the last few days but told The Times her companions did not do the same. She said: "I respect their decision. They urged patience and endurance in the caliphate and chose to stay behind in Baghuz." Ms Begum added: "There was so much oppression and corruption that I don't think they [IS] deserved victory. "I know what everyone at home thinks of me as I have read all that was written about me online. But I just want to come home to have my child. That's all I want right now. Speaking to ITV News, Ms Begum's sister Renu pleaded for the British Government to allow her to return back to the UK. "She's pregnant and vulnerable, and it’s important we get her out of al-Hawl camp and home as soon as possible," she said. "We hope the British Government will help us bring her home to us where she belongs. "This news has came to us as a shock and I ask the media to give us some space." Mr Wallace said: "The UK advises against all travel to Syria and parts of Iraq. Anyone who does travel to these areas, for whatever reason, is putting themselves in considerable danger.